Here are the upper shelves full of papermachee dolls of the area. The picture in the back shows Mrs. Miyauchi Fusa. Here are the lower shelves. I got two papermachee dolls from Mrs. Mikiko Miyauchi 宮内ミキコ, which I had ordered in spring. Even Mikiko is only making only a few dolls per year now.
. . . . . He is 15 cm high and wears a red belt with his name on it. His body is quite individually modeled. On the bottom he has the signature of MIKIKO, Takamatsu Hariko, Miyauchi. 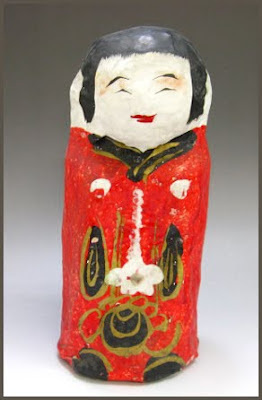 She was one of the most well-loved papermachee dolls of Shikoku and Western Japan. Her model is おまき O-Maki San, a dilligent servant girl to a princess. She sacrificed her own life, when her lady was ill. She took on herself the high fever of her lady and threw herself in the waves, washing away the illness of her mistress. Later parents bought this doll, gave it to a child sick with fever and then threw the doll into the waves to wash away the illness. 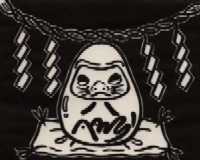 Now it is an amulet against sickness and given to a girl at the time of marriage. It is also a favorite souvenir for tourists.
. Gangu 玩具伝説, omochcha おもちゃ toy, toys and legends . Click for more photos from Takamatsu Hariko Dolls !
. 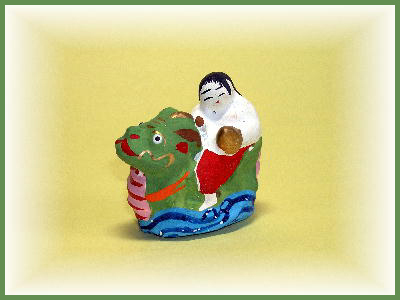 Regional Folk Toys from Japan - KAGAWA.